Error 11- The paper has run out. Reload paper. Error 12- Compartment lid is open. Close the lid to resume printing. Error 13- Paper is jammed in the machine. Clear the paper jam to resume printing. Error 14- No toner cartridge has been detected. Replace the cartridge or cartridges if they are empty. Otherwise, remove the cartridge and reinstall it to see if it is recognized by the machine. If you are still having problems, see Possible Reasons Your Cartridges are Not Working. Error 16 – The toner is running low. 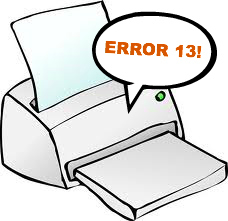 You can generally continue printing with this error, but have a replacement cartridge ready for when it runs dry. Error 20- The memory is overflowing or full. The document you are printing may be too large for the printer to handle. Try printing it a few pages at a time. Error 22- An issue has come up in the configuration. Stop the printing task, restart the printer, then try the print job again. Error 24- The memory that processes multi-page tasks is full. Stop printing tasks and restart the printer. Consider adding more memory. Error 40- An issue has occurred within the data transfer. Stop the printing tasks and restart the printer. Error 41- Unexpected paper size. Reload the paper tray with the correct-sized meda, or ensure that pages are not sticking together. Errors 50-53 are service errors that generally require a repair technician. You may wish to try restarting both the printer and the computer to see if it resolves the problem. Otherwise, call the manufacturer for support or take the device to a repair shop. Error 54- The duplex feeder is not working properly. Check the feeder for paper jams and restart the printer. Error 55- A break has occurred in the internal communication. Check the cables and restart the printer. Error 57- An incompatible memory card has been inserted. Make sure the memory card is compatible. Reinsert it firmly into the slot and try again. Error 61, 63, 67- There is some sort of defect with the formatter. Restart the printer and try again. Error 62x- The installed memory is defective. Try reseating the memory inside the printer if it accessible. Otherwise, consult a repair shop. Error 79- The software is being read incorrectly. Restart the computer and the printer and try again. Many of the numeric error codes are fairly simple to fix once you understand the problem. The most common involve an empty paper tray or cartridge, which are easy to remedy. For those errors that are not resolved by the solutions above, contact the manufacturer for support, or take your printer to a repair shop for a more comprehensive diagnosis of the problem.